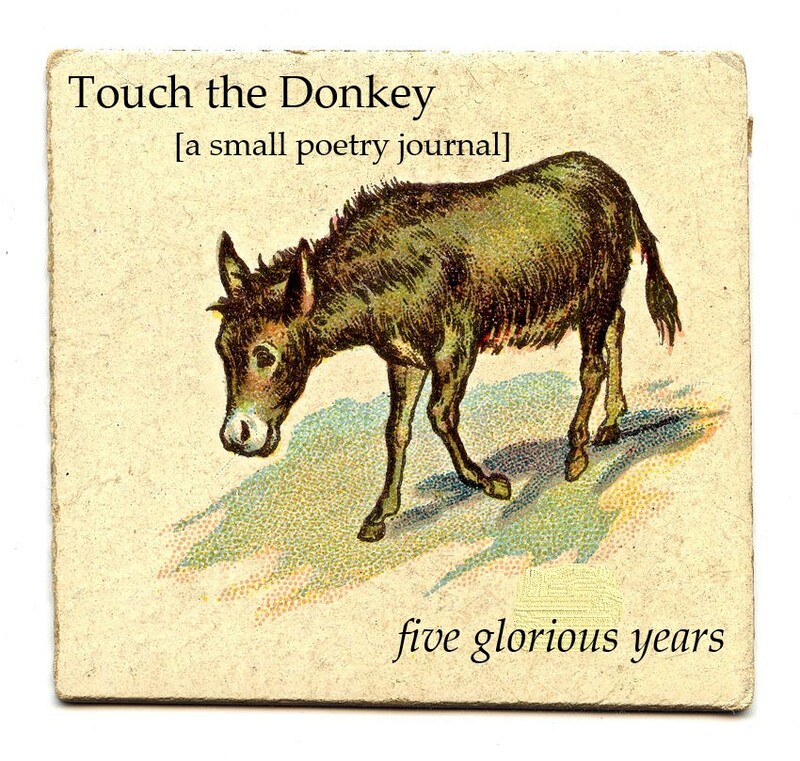 Her poem “fidgety as a snake” appears in the second issue of Touch the Donkey. Q: The poem “fidgety as a snake” engages with the poetic fragment. Your work is notable for its mutability, shifting forms far easier and far more often than most. What is your attraction to working such a multitude of forms? A: I like the push-pull of forms. in this series I have been putting in each the element of a cinquain, a bit of earworm made into misheard lyrics/homophonic translation, and some pieces of ghazals, all of which fit together into some intuitive way. Q: Do you mean the poem “fidgety as a snake” itself as a series, or is it part of a larger construction? Or both? A: it is one poem. there are several in the pattern. I’m seeing how long I can repeat the pattern with variations while each can feel distinct. I have somewhere around 30 pages of it. Q: I’m curious: is this normally your process? Are you simply producing until certain works begin to group together? Q: Given that, how many projects might you be working on at any given moment? And how do you cohere groupings? Are they based on subject, style or something else entirely? A: I file poems by month. when it’s time to go to a manuscript stage again, I go thru the tags and pull out poems that I recognized as being potentially in a cluster; in the surreal manuscript, or in the Apostrophe and Semicolon sonnets, or haiku or whatnot. those are easy. I have 12 active unpublished manuscripts by theme/style/feel/method/form/simplicity vs. chaotic. these clusters may go out to book length, contract to chapbook, expand back out to book length and contract back to being a few worthwhile poems that may go in a mixed bag manuscript. those I’ll shuffle by gut into an order that links and shifts in energy to the next poem. more like the soft connects of the poem in the issue but on a larger scale. Q: Perhaps you’re not the one to answer, but do you see any particular threads emerging through the writing you’ve done so far? I’ve seen poems of yours that engage with uncertainty and the possibilities of language as well as history, family and train travel. A: I like open-endedness and uncertainty. part of that is in not wanting to be told something and what to feel about it. that is a rude hierarchical relationship—to persuade the reader to feel. I want to be on equal cooperative footing with my reader or writer not part of arm-twisting. at the same time, as a reader, I exclaim, you should read this because x happens. of course, "x happens" is a useless way of conveying what was the worthwhile part. much is the how in storytelling. that said, poetry can be a respite from plot-driven, one-subject, one-mood, one-purpose, one-arc-with-no-extraneous structures. what subject threads do I use? people seem to remark on my density and playfulness of language as distinctive more than subject threads. once, having read poems about anxiety and cherishing, I left stage to be told "thanks for those, um, laundry poems.” I realize some people aren’t in a pace and place to listen. or maybe certain information only can convey to certain people. a hot potato doesn’t work in a long lob. I write of history? what isn’t history? there is nothing outside of history any more than there is anything outside of chemistry or physics. but yes, family history in part and larger histories in part as a political act of amending the record of the rich and warmongering. I’d rather archive poverty. I’d rather archive routes to resolution than titillating bits of conflict. because I was not told family history I felt shut out of the family. shared stories make community. as an adult I begin to collect what I could after decades of gaps in an attempt to own or be owned I suppose. or make pieces make sense. what bias got to it all before mine? what was omitted? can any amount of sleuthing put me back in time to make the data rich again? I can speculate on how it was. but then the present is the same process of inference, partial information, forming patterns to cross-check against future. I like to direct reader eye to things not about people—the ant as an individual with its characteristics not as a symbol. symbolism and relating with empathy creeps in. the symbolic mind is harder to shake than a private detective behind on his rent. I like what falls under the etc and like the open box that poetry can be. important stuff will never come up in the structures that exist. the most important things may never be segued into any conversation or poem form, but that doesn’t mean they can’t have a place in poetry. pointing to different things and the same things differently matters. poems are to expand self and alertness, not reinforce dim old selves. the shape of ideas and the relationship between ideas. like “laundry” and “launwet”. this false etymology of “laundry” and backformation is immensely amusing. I think the useful isn't just the subjects but the angle of engagement. does the collective utterance make a mandala of a world that is inclusive, playful, thoughtful, compassionate, questioning, curious and about flourishing and resilience? is that my aboutness? if so, I often fail. joy is the hardest thing to write and convey. can a joyful mind access a sorrowful one or the reverse? or do they look like satire to one another? in some streams of poems I resist aboutness. in some I use the constraints of picking a piece of context to juxtapose or explore one particular line of thought to overturn it and overturn it. I trust a poetry that is willing to upend itself. one sustained thought seems smug. maybe that’s a matter of vestigial class informing permitted emotional attitudes. Q: Some of this feels reminiscent of the way Dennis Cooley appears to construct poetry manuscripts—out of a collage of pieces that write entirely around, through and from every angle a particular subject, and yet, your process feels far more organic than deliberate. Are there any particular authors or works that stick in your head as you write? If literature is a conversation, who or what do you feel yours is in conversation with? A: danger, danger, this answer might be long. but also, thanks, this has been helpful in the harried time of assembling chapbooks. good to consider why I’m in this enterprise. composing isn’t about the manuscript making but an extension of my senses and of processing—that’s probably not uncommon. I can’t say I have a comprehensive plan, strategy and consistent gaze towards examining a few things in particular like Cooley. I have issues I return to like a comedic relationship with hypochondria, but they’re a small part of the bandwidth. and it would cease to be funny if the joke were “run 10 miles underground” as you once put it. I don’t do serial projects but parallel. rarely have a preoccupation with one project. I seek life balance and cut off obsessive spirals. flow state is something different tho. that may be is what all the poetry seeking is about. that timeless wordless yes. conversation with who? I prioritize taking a lot in. I go to a lot of readings, from a few a month to a few dozen a month in festival seasons. I consume a books of poetry every 2-4 days, and a lot of articles, blogs, and conversations. a lot of it I don’t understand or know how to appreciate but with a lot of data, the lesser patterns rise. and it’s nice to be in a room where some people are getting blissed out at having their itches scratched even if it doesn’t reach me. I think I like sound poetry more than any other kind of poetry. I don’t compose it or perform it but it seems to move me like I see page or stage poetry moving other people. poetry is more a means to an end—the artifact is gratifying but the end is further out—in being a catalyst for what next for self or for someone else. I am not usually responding to one work in particular, but the seeds of Vertigoheel for the Dilly started with my version of Lyn Hejinian’s My Life. that was a case of book length boiled down to chapbook length. and there’s Apostrophe and Semicolon of course. there I am responding line by line with a typographical modern humanist world of Astrophel and Stella. but the majority of time and the majority of poems are coming from various reactions, resistances and etc. Q: Who do you read to reenergize your own work? What particular works can’t you help but return to? what books do I read to reenergize? something I don’t know enough about. birdwatching. snails. something that makes me slow down such a broadsheet in French by Tadeusz Kantor: la leçon d'anatomie d'après Rembrandt (from les éditions derrière la salle de bains). I tend to read a dozen or more poetry books in parallel as palate cleansers to each other so I can taste each of them freshly. some more dense, some light. some stories, some essays. I like to read things from contemporary and have at least one in the mix from at least last century ago. I’m currently reading DH Laurence’s The Daughter-in-Law. ah, and that is why people would write a play. in novels and poems people sometimes pretend there are more than one pov reflected but it feels puppeteered. this seems more like a snapshot of intersections of actual lives with their separate motivations and we listen in. I don’t need to understand every word. it underscores how much we can understand when even all we have to go on is contrast between page squiggle shapes. no body language, no common culture and point of reference with coal miners, no shared lived experience, no shared dialect or expression and yet staying in it, personalities emerge. isn’t language magic? Ryan Pratt reviews the first three issues over at the ottawa poetry newsletter! Touch the Donkey (and ottawater) interview at The Review Review! Touch the Donkey self-profile at Open Book: Ontario! Touch the Donkey on Facebook! subscribe to our posts for issue notifications!